One of the most iconic places of religious importance for Sikhs, the Golden Temple (Sri Harimandir Sahib) in Amritsar is a destination where people can come to express their faith in the face of true tolerance and equality. 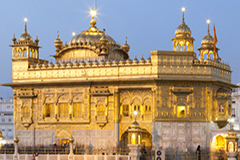 An important pilgrimage site, Sikhs come from all over the world to pay their respects. The construction of the temple (Gurdwara) was authorized by the fifth Sikh guru, Guru Arjan, in the 16th Century in the hope that people of all creed and religion could use it as a holy place to worship God. It was completed in 1604 with its final design featuring four distinctive doorways to symbolize Sikhs open embrace and acceptance of other ethnicities and religions. It was at this time that Guru Arjan placed the Guru Granth Sahib, a holy book of scriptures considered to be a spiritual guide, inside the temple. 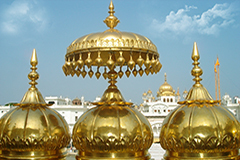 Its distinctive architecture differs from other normal Gurdwara’s that are built at a high level. The Golden Temple has been designed in such a way that devotees have to descend down steps rather than climb them to resemble an act of humility. The temple as you see it today was rebuilt in 1764 but it wasn’t until the beginning of the 19th century that Maharaja Ranjit Singh decreed that the lotus shaped dome was to be covered in 100kg of gold, hence its name. Within the temple, there are many shrines dedicated to noted Sikh gurus and saints. There are also many plaques that recognise important historical Sikh events. Over 100,000 people visit the Golden Temple every day and as a visitor, it is critical to respect the sacred purity that is so revered by pilgrims. When entering the Gurdwara, you must always be barefoot and wash your feet in the small pool beforehand. 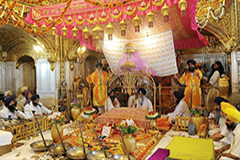 Once inside the Darhab Sahib, it is important to sit on the ground as this is seen to be an act of deference to Guru Granth Sahib and to God. There is a strict policy against eating meat, drinking alcohol or smoking when you are within the confines of the shrine. Women must be clothed respectfully and have their head covered although shawls can be provided or bought on-site to take home as a souvenir. 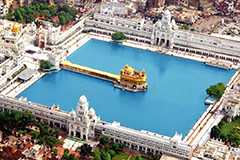 The Gurdwara is surrounded by a tranquil lake (Sarovar) which is said to contain holy water or ‘Amrit’. It is advised to allow yourself a few hours to explore the temple so you can absorb the majestic spirituality that emanates from this holy place. Dining at the Guru-ka-Langar hall within the temple complex is a sight to behold. Every day volunteers feed 35,000 pilgrims for free and all visitors are invited to attend and eat together in unity while sitting on the floor. 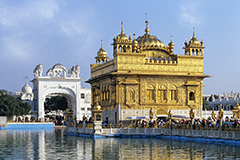 There is also very cheap accommodation available for guests if they would like to stay at the Golden Temple and gain a heightened awareness for the faith and spiritual energy that pulses from every corner of this special place.